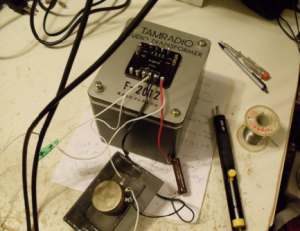 Triode single end amp’s warm sound but less power leads Diyers to find other solution. Tetrode push pull amp gives larger power but sounds no good. is reduced sound quality. This is because the plate curves are much more even distributed for triodes. 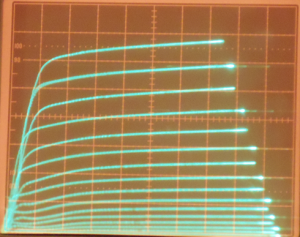 Some body uses triode connection ( screen grid connected to plate) to get the plate curves looks like a triode but with reduced output power, there is not thing new. For a specified grid negative bias the plate current remains almost constant throughout the graph. But the plate current increases as the screen grid voltage increases. 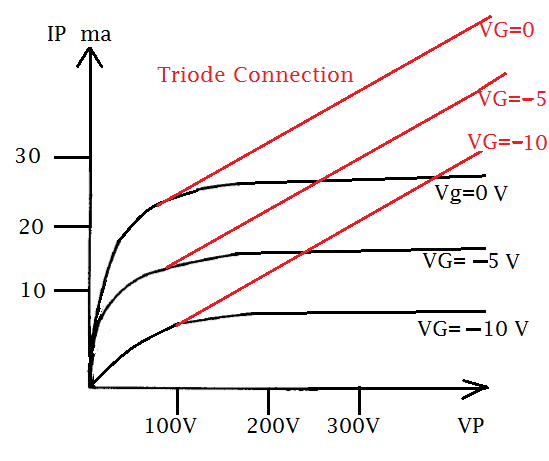 The relationship between plate current and screen grid voltage is directly proportional to each other and quite linear. 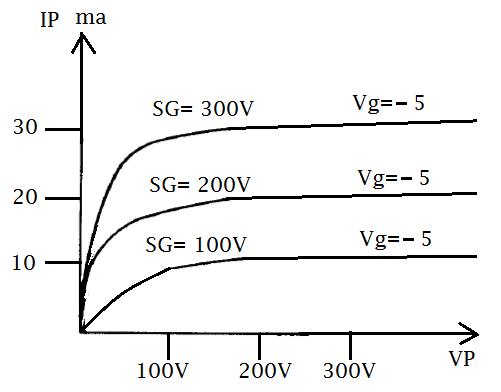 As an example , the -5V grid bias curve gets Ip 10 ma for SG 100V and 30ma for SG 300V. On other word the plate current Ip is sensitive to screen voltage but not sensitive to plate voltage. 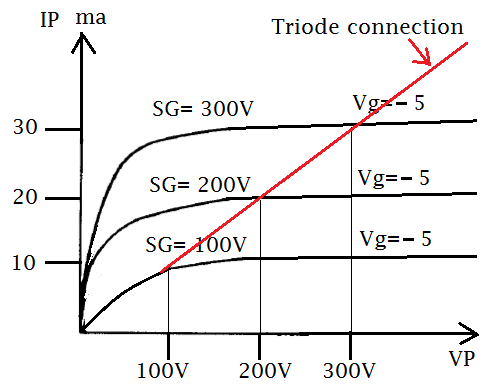 We find the direct proportional relationship , in this case screen grid voltage is a constant throughout one step as the plate voltage increased from 0 to 300V to get the curve. 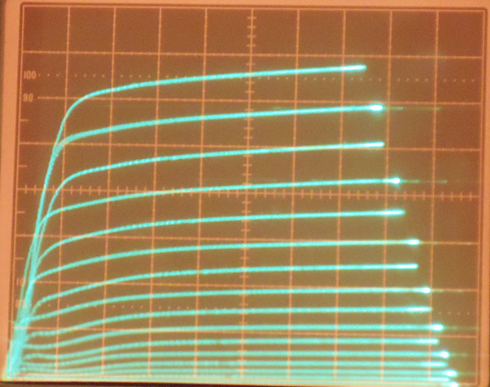 And we get this result from three steps, screen grid voltage 100V, 200V and 300V. 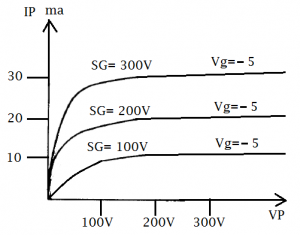 The screen grid voltage no longer constant but follow the plate voltage. The plate curve follows the red line now. Ok, now we understood screen grid connected to plate will get the plate curves looks like a triode. Yes, I said it looks like . The story is not yet finished. We find that the distribution of the curve family is much more even in tube 245 real triode, but not so even from that of 5881. How come ? We can see the curve family is not evenly distributed as a well known shortcoming of tetrodes. 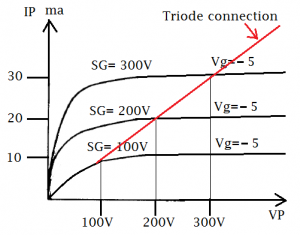 So that triode connection will improve a lot in Total Harmonic Distortion (THD) is only a beautiful misunderstood. 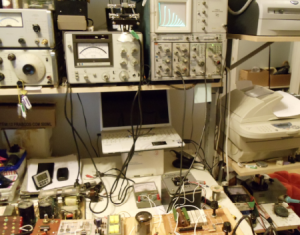 According to this circuit I arranged a curve tracer test , a 5881 tube with Tamura 2012 PP output transformer in ultra linear connection and the VR is 5K/4= 1.2Kohm. Adjust the VR can get 0% to 100% ratio. 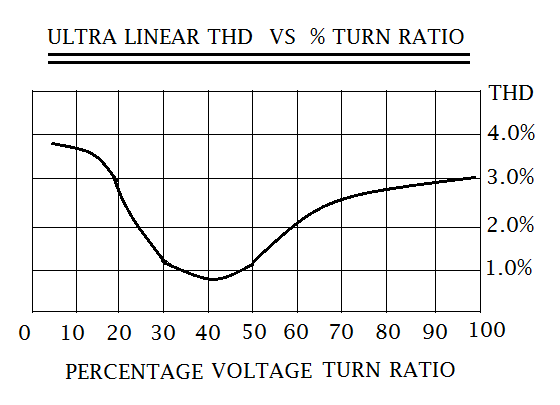 Compare with triode connection, 42% UL connection got a more even curves as well as lower THD. One more thing, curves more close to vertical position means lower plate internal resistance (Ra) as well as better damping factor. 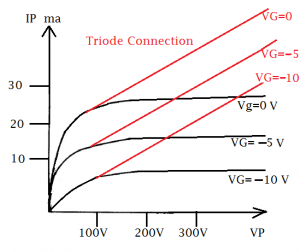 These advantages plus more output power UL obviously will defeat triode connection. 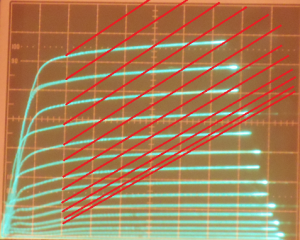 The result is amazing , the lowest THD comes on about 40% ultra linear tag , it is better than triode connection in THD measure. 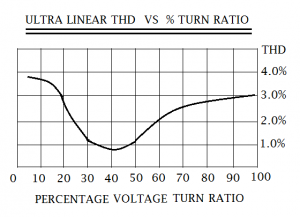 Before I got the curve tracer results I always suppose that triode connection is the best, then ultra linear and tetrode connection is the worst , many DIYers agree as a common practices. 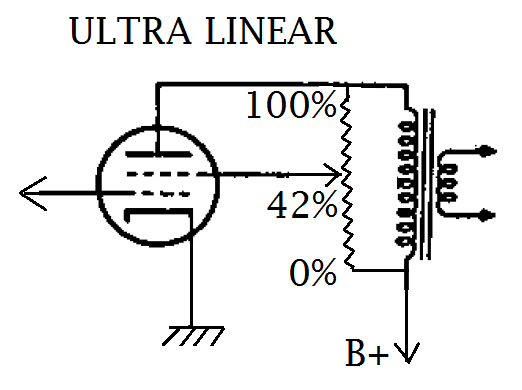 Now I suppose ultra linear is the best then triode connection and tetrode connection still the worst. This changes the situation a lot, the question is , is it still worthwhile to rearrange a triode connection for those vintage tetrode machines without an ultra linear tag on output transformer ? If the answer is no, may be some high sought vintage machines coming down from the heaven. I will only build PP machines with about 40% UL connection, those ancient and modern PP output trasnsformers without ultra linear tags are wasting time. 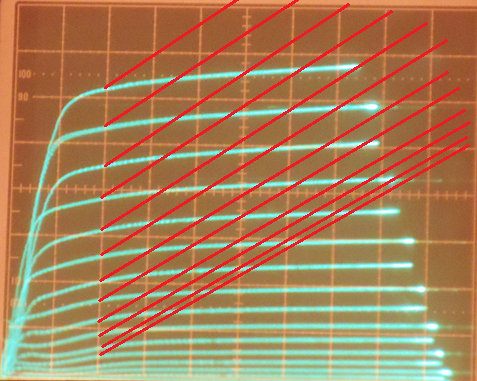 I am not saying that ultra linear connection solves all the PP power amp problem, but at lease we had cleared one part, yet the PP cross over distortion is still waiting for us. What you show here is really neat. I don’t think I’ve seen anything else like it on the internet. Ultra-linear curves are hard to find. 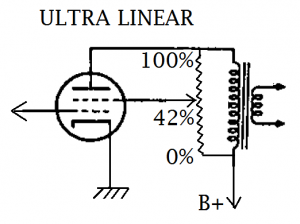 Do you happen to know what the best plate to plate impedance for 2 ultra-linear connected 6L6/5881 tubes at 425 volts and running in fixed bias would be? What about 4 tubes? I’ve heard 5000-6600 ohms for 2 tubes and 3000-4300 ohms for 4 tubes but there doesn’t seem to be any clear answers. Any help would be greatly appreciated. Thank you.